Do you buy things just because they're on sale? Do you sometimes hide purchases from your friends and family? Do you feel anxious when you're not browsing store aisles or retailer websites? If so, you may be a shopping addict – an affliction uncovered by a significant portion of respondents to a recent CreditDonkey.com survey. Since one key indicator of addiction is denial, we didn’t expect many respondents to raise their hands and announce, Yes! I’m a shopaholic! But the survey results reveal a significant percentage of consumers display some, or all, of the warning signs of shopaholism. These red flags include feeling guilt or shame after shopping (which 36.7 percent of respondents have experienced), hiding purchases from their families (20.5 percent), and checking available credit at least once a week (26.7 percent). However, just 4.7 percent of respondents said they have been labeled “shopaholics." 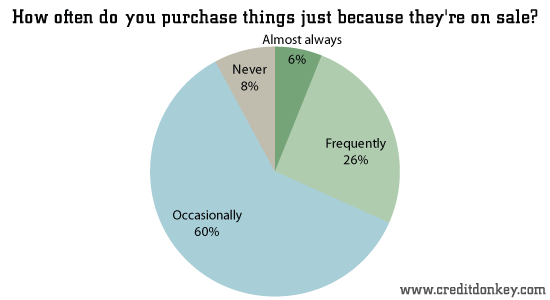 18.1 percent said they often purchase items that they don’t need or didn’t plan to buy when they set out to shop. 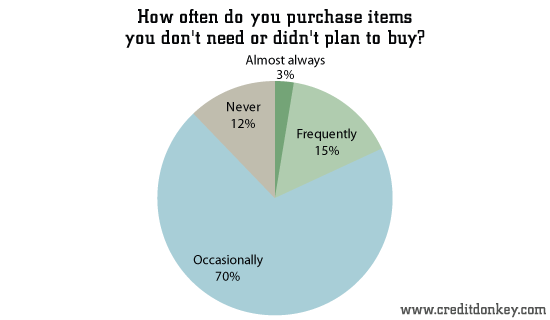 24.4 percent admitted they have items in their closets that are still in shopping bags or have price tags. 19.1 percent said their main reason for using credit cards is to pay for items when they don’t have enough money. We were happy to learn that most consumers use credit cards for the sake of convenience or to save money via rewards programs, but the fact that so many people treat credit cards as extra spending money is disturbing. When people routinely spend so much on their cards that they can’t pay off the monthly balance, we recommend that they temporarily suspend their card use – say, for 30 days. This will help them distinguish between when they’re buying on impulse and when they’re purchasing things they really need. If you're feeling blue, you'll want to think twice about going on that shopping spree. Studies have shown that our mood can have a great effect on how we spend our money. Sadness will likely lead to unwise shopping decisions. PayPal's credit card offers perks to lure loyal users. But is it the rewards card you need in your wallet? Read up on the best benefits and a few drawbacks in our guide. Leave a comment about Survey: Shopping Addiction Statistics? Share on Facebook "Survey: Shopping Addiction Statistics"